My favourite freefrom friendly restaurant so far for 2015 has to be Brasserie Blanc. Last year it was The Alford Arms in Frithsden, who won the FreeFrom Eating out Awards 2014. Check out Alford Arms Wins FreeFrom Eating Out Awards 2014 to find our more about them. My best find so far in 2015 is undoubtedly Brasserie Blanc. Thanks to my friend Karen for telling me about them and inviting me for a meal there one wintery day in January. I have long admired Raymond Blanc and the simple no nonsense way he talks about allergens on his cooking programmes. He has taken this approach into his chain of high street restaurants and created a safe, friendly and easy environment for allergic and coeliac diners. For those coeliacs out there and people avoiding just gluten and dairy – all your problems are solved. Just ask for their gluten and dairy free menu. Well this week I went back and once again, did the booking, letting them know in advance what I couldn’t have, what I ate last time and most importantly, what I could eat. They have a pretty nifty online booking system which you can update afterwards if you need to change the time or number of guests. I was with Liz Allan of Allergy Aware Kitchen who also has to avoid all gluten so she was delighted with the gluten free menu. We were greeted with a friendly smile when we arrived and the allergy menus were already waiting for us on our table. No need to even ask for them. The manager came over to assure me that they had received my allergy information and that the chef was able to prepare quite a few items on the menu for me. These were explained by our delightful waitress Christina. I know I sound like I’m gushing here, but Christina was just lovely. We got chatting and found out she was a teacher from Romania and her mother also has allergies to nuts and dairy amongst other things and has problems eating out back at home. Her Mum longs to find a restaurant where having allergies was just normal and a menu would highlight the foods she could have. So straight away we knew we had a waitress who got allergies – who had seen the trouble her own mother had eating out in Romania. Raymond? Maybe you might consider taking Brasserie Blanc to Romania – Christina’s mother needs you! Christina told us that as part of all the staff training allergies are major part; all staff are expected to learn the ingredients in all the dishes and to understand what each of the 14 major allergens are. They also take an exam and if you don’t reach the required level you don’t get to work at Brasserie Blanc. It just goes to prove, if you employ great staff and invest training and time in them you create a friendly and outstanding customer service experience. 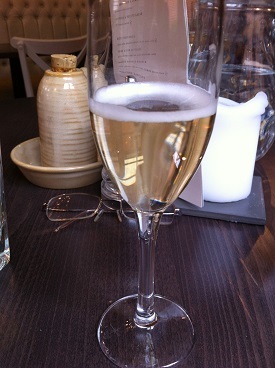 When we had chosen our meals we got a surprise glass of champagne on the house! WOW! It was a thank you for having sent in a glowing testimonial about my first visit so thank you Brasserie Blanc. You really didn’t need to, just being so great is thanks enough, but what girl doesn’t love a glass of fizz? If you have more allergies than just gluten and dairy, speak to the staff and you will find the chef can adapt quite a few of the dishes to accommodate you. I can’t eat nuts, dairy, wheat, soya, celery or tomato. This wasn’t a problem at all. There were at least five options that could be adapted including the steak, mussells, pork belly, salmon and salads. I chose the Salted Beef salad to start and it was so pretty. 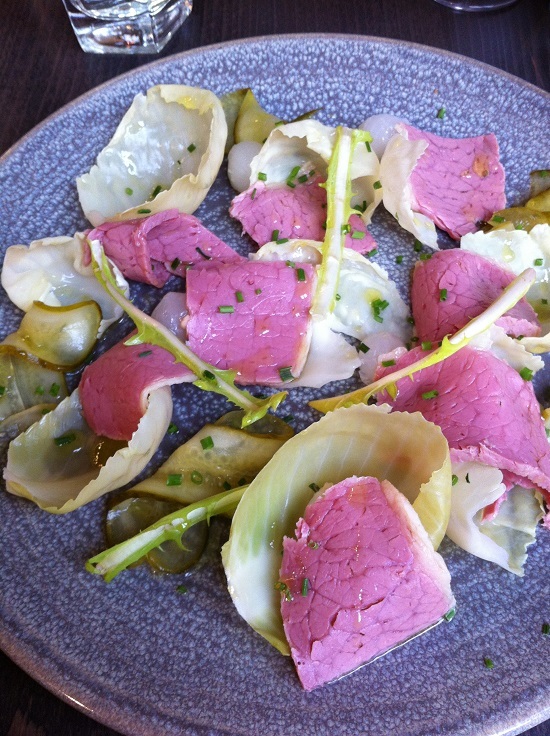 Pink juicy beef with just the right salt seasoning with cabbage, gherkins and cournichons. Polished that off rather sharpish. This too was dairy, wheat, soya, nut, celery and tomato free. 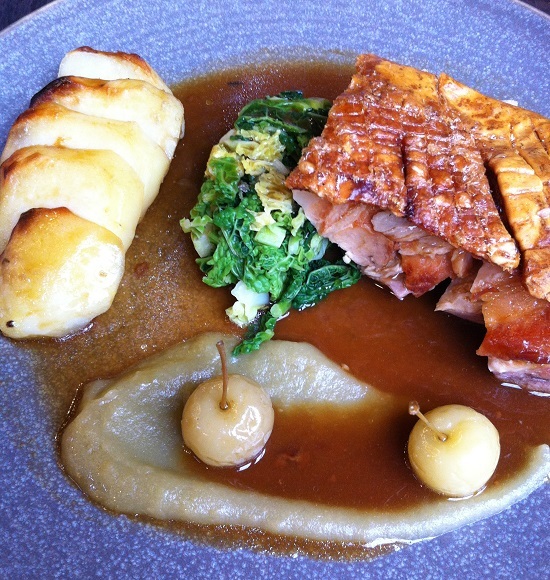 The pork was melt in the mouth and the crackling had just the right bite, not enough to dislodge a filling but tasty and satisfyingly bad for you. The little crab apples were almost too cute to eat but eat them I did and having potatoes that weren’t just jackets or new was also quite a change for me. Not sure quite what turns them into Chateau potatoes but they were very good. And there was some lovely cabbage AND gravy – I’m happy to have meals without the sauce or gravy. I’m used to it. It’s often the safest option, but it transforms the eating experience to have that extra component. I’m rubbish at making gravy too – the sieve came out last week to remove lumps so this as a delicious treat. This year’s new years resolution is to master wheat free gravy. Mine at home is rather hit and miss and usually hits the bin, not our plates! Really top notch allergen safe catering. It’s not hard when you have the processes in places and a simple menu that can easily be adapted. I would like to thank the chef for being so amazingly accommodating – I know I’m fussy but I don’t want to be. Thank you to all the staff, especially the manager for giving us fizz and the rather charming Christina for giving me the peace of mind that she totally understood all of my questions, checked stuff with the chef and put my mind at rest that it would all be safe. 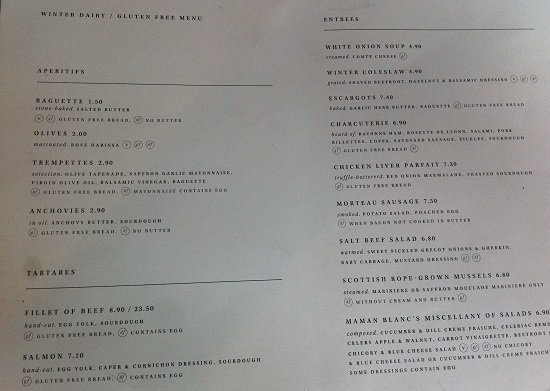 Lastly, thank you Raymond Blanc for having the vision and the foresight to make this allergy menu happen. It means a great deal to just be able to feel normal and choose from a menu without too much fuss and bother. And also to have something other than steak! I will be back. The only reason for not awarding 10/10 is firstly because I never give a 10; there is always something to improve on. The only thing that would help might be some labelling for the other allergens, maybe the Top 8 if not the Top 14. It was a joy to eat here and I would recommend it to coeliacs and allergic diners alike. Great choice and fantastic service.